This article is about a mountain in Morocco. For other uses, see Jebel Musa (disambiguation). View of Jebel Musa from Benzú, in the Spanish enclave of Ceuta. Jebel Musa (Arabic: جبل موسى‎, Jabal Mūsā, in Berber Adrar n Moussa; meaning Mount Moses) is a mountain in the northernmost part of Morocco, on the African side of the Strait of Gibraltar. It is part of the Rif mountain chain. The mountain is generally identified as the southern Pillar of Hercules, Abila Mons. Jebel Musa, named, according to the 14th-century Berber Muslim geographer Ibn Battuta, in honour of Musa bin Nusayr, to whom the conqueror of Andalusia Tariq ibn Ziyad owed fealty, was known to the ancient Greeks as Mount Abyla and to the Romans as Columna. 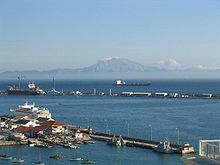 Together with the Rock of Gibraltar to the north, it is generally identified as one of the Pillars of Hercules (this title is also claimed for Monte Hacho in the Spanish exclave of Ceuta, to the east of Jebel Musa). Jebel Musa, viewed in telephoto lens from the shore of Cadiz Province, Spain. The name 'pillars of Hercules' derives from one of the twelve labours assigned the Greek hero Hercules. Perseus had defeated the Titan Atlas by showing him the head of the Gorgon. Atlas was petrified; his hair became a forest and his shoulders became cliffs. Hercules was then directed to get the Cattle of Geryon and deliver them to Eurystheus. Hercules' way was blocked by the mountain that Perseus had created; to clear a way, he used his mace to split the mountain in half, one part becoming the Rock of Gibraltar and the other becoming a mountain in Morocco. According to the myth, this split in the mountain created a sea link between the Atlantic and the Mediterranean Sea. This link was the Strait of Gibraltar. Jebel Musa is 842 metres (2,762 ft) high. To the north, across the Strait of Gibraltar, lie Spain and the British Overseas Territory of Gibraltar. To the east is Ceuta, a Spanish exclave, and to the west and south is Morocco. By road, the mountain is about 22 kilometres (14 mi) west of Ceuta and about 72 kilometres (45 mi) east of Tangier. Jebel Musa is opposite the Rock of Gibraltar at the entrance to the Mediterranean Sea from the Atlantic Ocean. It is an important landmark in the region of Tanger-Tetouan-Al Hoceima on the north coast of Morocco. The coastlines around the mountain show evidence of having had varying sea levels through the ages. These highstands are at 120–130 metres; 80 to 90 metres; 40 to 60 metres and from 0 to 25 metres above the present sea level. In Ceuta, around the town of Benzú, the mountain is known as The Dead Woman (Spanish: la Mujer Muerta), because from that direction it resembles a woman on her back. The mountain is a site for birdwatching. Migratory birds use the updraughts and thermals from Jebel Musa to gain height before attempting to cross the Strait of Gibraltar. The Strait of Gibraltar is "one of the world's most prominent" migration bottlenecks and raptor watching is popular in the fall, though the best observation points may be north of the Strait. The area around the mountain has over 200 caves that attract visiting cavers. 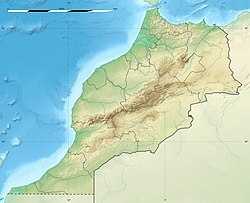 The area around the mountain is mainly forest and is identified in the Plan for Protected Areas in Morocco as a Site of Biological and Ecological Interest (SIBE). ^ H.T. Norris, Ibn Battutah's Andalusian Journey", The Geographical Journal, 1959. ^ "Pillars of Hercules". mlahanas.de. Retrieved 19 July 2012. ^ Clammer, Paul (2009). Morocco p. 168. Lonely Planet. p. 536. ISBN 9781741049718. ^ "Jebel Musa: Morocco". National Geospatial-Intelligence Agency, Bethesda, MD, USA. Retrieved 19 July 2012. ^ Rodríguez Vidal, J.; L.M. Cáceres Puro (2005). Rodríguez Vidal, J., ed. "EVIDENCIAS MORFOLÓGICAS EROSIVAS DE NIVELES MARINOS PLEISTOCENOS EN LA COSTA DEL JBEL MUSA (N. DE MARRUECOS)". Libro de Actas. Gibraltar Museum. ^ Clammer, Paul (2009). Morocco p.192. Lonely Planet. p. 536. ISBN 9781741049718. ^ Ham, Anthony (2007). Morocco p.176. Lonely Planet. p. 528. ISBN 9781740599740. ^ "Agence de Voyage". rif planete. Retrieved 19 July 2012. Wikimedia Commons has media related to Jebel Musa. This page was last edited on 27 February 2019, at 11:40 (UTC).